Alzheimer's disease (AD) is a chronic degenerative disease and by far the most frequent cause of dementia in the elderly (over 50,000 people in Croatia and over 24 million people worldwide). Recent figures from Alzheimer's Disease International estimate that in 2010, AD cost the world economy 1% of its global GDP (444 billion euros). It is expected that AD overall prevalence will quadruple to 106 million by 2050; thus dementia will be one of the main health issues of the next decades and the need for effective treatments is urgent. AD is characterized by the presence in the brain of plaques composed of amyloid beta (Aß) peptide and of neurofibrillary tangles (NFT) made of hyperphosphorylated protein tau. Based on the discovery that a mutation in the APP gene was able to induce AD in familial cases of the disease, the dominant view on AD pathogenesis for the last 20 years has been the amyloid hypothesis. This led to a somewhat premature conclusion that Aß is the main trigger of the disease not only in familial (0.45% of all cases), but also in all other (sporadic) cases of AD. However, neuropathological data does not correlate fully with the amyloid hypothesis. As early as 1997, Braak and colleagues have shown that tau pathology in the entorhinal and hippocampal regions precedes Aß accumulation by at least 27 years. It may not be surprising therefore that more than twenty recent clinical trials of potential disease-modifying drugs based on manipulation of Aß have failed. The current prevailing clinical criteria for diagnosis of AD (the NINCDS-ADRDA, the DSM-IV-TR and the ESFN guidelines) are focused mostly on cognitive deficits produced by dysfunction of hippocampal and high-order neocortical areas, whereas noncognitive, behavioral, and psychological symptoms of dementia (BPSD) have been less considered. The early occurrence of these symptoms, especially depressive symptoms, suggests brainstem involvement, and specifically of the serotonergic nuclei. In spite of the fact that the current criteria do not include their evaluation, several recent reports, including ours, drew attention to the possibility of the selective and early involvement of raphe nuclei (particularly the supratrochlear part of the dorsal raphe nucleus) in the pathogenesis of AD. This prospective 3-year study therefore aims to define the relationship between the early AD and several modalities for early detection of disease biomarkers: total tau (t-tau) and phospho-tau (p-tau) proteins, as well as Aß42 and sphingolipids in cerebrospinal fluid (CSF), magnetic resonance imaging (MRI) brain volumetry, perfusion single-photon emission computerized tomography (SPECT) and gene-expression profiling. Our foremost long-term objective is to determine whether our approach using a combination of biomarkers and genomic profiling analysis can reliably diagnose very early, preclinical stages of AD. Early detection, to identify those patients most likely to benefit from therapeutic intervention, is an ultimate goal. Our preliminary findings indicate that subjects with early AD (defined as subjects with cognitive dementia rating, CDR, of 0.5 or less, who have additional BPSD) may be differentiated from matched neurological controls and from clinically diagnosed AD subjects and patients with other primary causes of dementia. Since, at present, definitive diagnoses of AD and non-AD primary causes of dementia are only possible by the direct histopathologic examination of brain tissue, the ability to better characterize subjects with early AD by using biochemical and imaging biomarkers coupled with genomic profiling has a high potential significance for AD detection in its prodromal, asymptomatic stage. Within the described framework, we have defined two specific objectives. 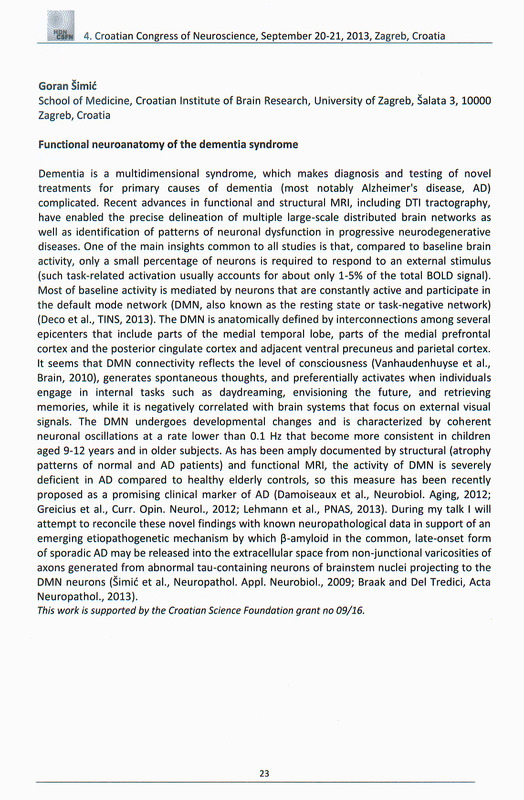 First, as AD and other causes of dementia have overlapping clinical features, making distinction among them using biomarkers and proposed imaging modalities is important because of very useful diagnostic and therapeutic implications and prognosis. Second, as AD patients frequently develop depressive symptoms, and depressive patients frequently develop AD, the follow-up of patients with AD with or without depressive symptoms will likely reveal which biochemical and imaging biomarkers together with genetic factors may contribute to the risk of AD. As many drugs in development are directed at modifying pathogenesis, particularly tau phosphorylation state, validation studies in existing and prospective cohorts of AD patients are clearly needed to advance diagnostic criteria and optimize their sensitivity, specificity, and accuracy. In conclusion, our results to date have consistently supported the hypotheses that are driving this work and our pilot studies published in 2007, 2008, and 2010 warrant a project of this size. 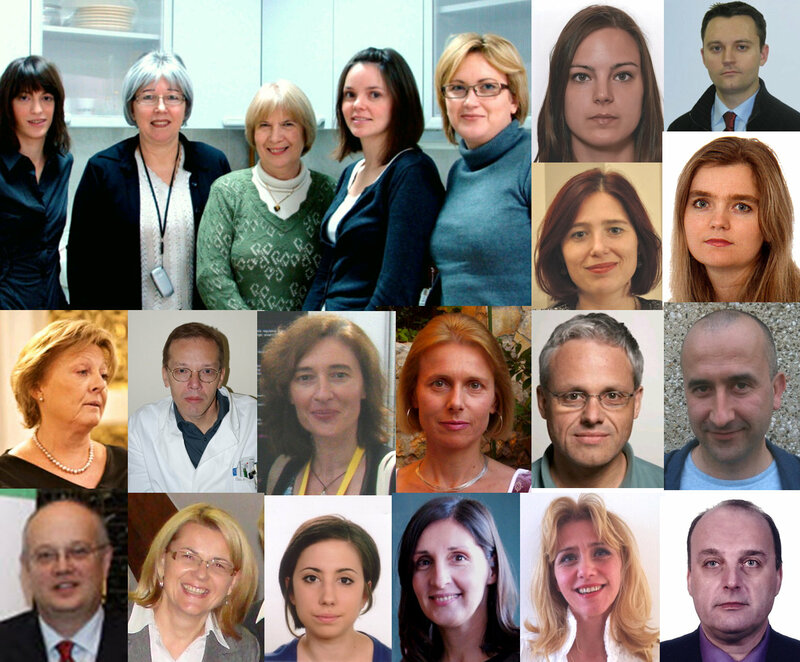 We expect that a combination of early detection of AD using sensitive CSF biomarkers, brain imaging, determination of selected gene polymorphisms and expression profiling would improve distinguishing among different neurodegenerative diseases accurately and would have a major positive impact on improvement of scientific research in biomedical sciences in Republic of Croatia as well as for the progress in medical care in general. Sporadična Alzheimerova bolest je nenasljedna kronična degenerativna bolest i najčešći uzrok sindroma demencije u ljudi starije dobi. Zbog porasta udjela starijih osoba u populaciji broj se oboljelih stalno povećava, pa je rano dijagnosticiranje i iznalaženje učinkovitog liječenja postalo goruće pitanje. Bolest karakterizira prisutnost kuglastih nakupina (plakova) u međustaničnom prostoru moždanog tkiva, što su sačinjeni od proteina beta-amiloida, te nakupina krutih snopića unutar živčanih stanica koje čine patološki promijenjeni tau proteini. Tau proteini stabiliziraju mikrotubule, a mikrotubuli su za normalnu funkciju živčanih stanica neophodne "tračnice" po kojima se odvija dvosmjerni transport, npr. molekula neurotransmitera potrebnih za prijenos živčanih signala. Naše istraživanje usmjereno je na definiranje povezanosti najranijih simptoma demencije u osoba sa sumnjom na Alzheimerovu bolest (naročito depresivnosti i otežanog prostornog snalaženja u inovativnom testu skrivenog objekta) i bioloških biljega takvoga ranog stanja, prvenstveno koncentracije patološki promijenjenih tau proteina u uzorcima cerebrospinalne tekućine (koja se, uz informirani pristanak pacijenata, dobiva lumbalnom punkcijom). Usporedbom tih podataka s promjenama registriranim slikovnim prikazom strukture i aktivnosti mozga te varijantama pojedinih gena koji su možda povezani s ranijim nastupom bolesti očekujemo potencijalno važne spoznaje za razvijanje novih načina rane terapijske intervencije u Alzheimerovoj bolesti. Dosadašnja istraživanja Alzheimerove bolesti pokazala su da se početni patološki procesi koji dovode do bolesti odvijaju i 15-20 godina prije izraženih simptoma. Kao najvažniji očekivani konkretni rezultat projekta stoga smatramo doprinos uspostavljanju kriterija za najranije moguće donošenje pouzdane dijagnoze Alzheimerove bolesti i njezino razlikovanje naspram drugih primarnih i sekundarnih tauopatija. Na temelju preliminarnih rezultata dobivenih na manjoj skupini bolesnika u kojih su razine fosfo-tau proteina u likvoru bile statistički značajno povećane u odnosu na nedementne kontrolne ispitanike, očekujemo da će pronalaženje takvih i njima sličnih (povećanih) vrijednosti koncentracija ukupnih tau proteina te ostalih fosforiliranih tau proteina dati odgovor na pitanje koliko su ti biljezi osjetljivi i specifični indikatori patoloških promjena živčanih stanica nastalih uslijed Alzheimerove bolesti, čak i kada još nisu jasno izraženi klinički simptomi i znakovi bolesti. Proteomska analiza cerebrospinalne tekućine u Alzheimerovoj bolesti, Medix 2012; 101: 25-29. Biomarkeri u dijagnostici Alzheimerove i Lewyjeve bolesti. 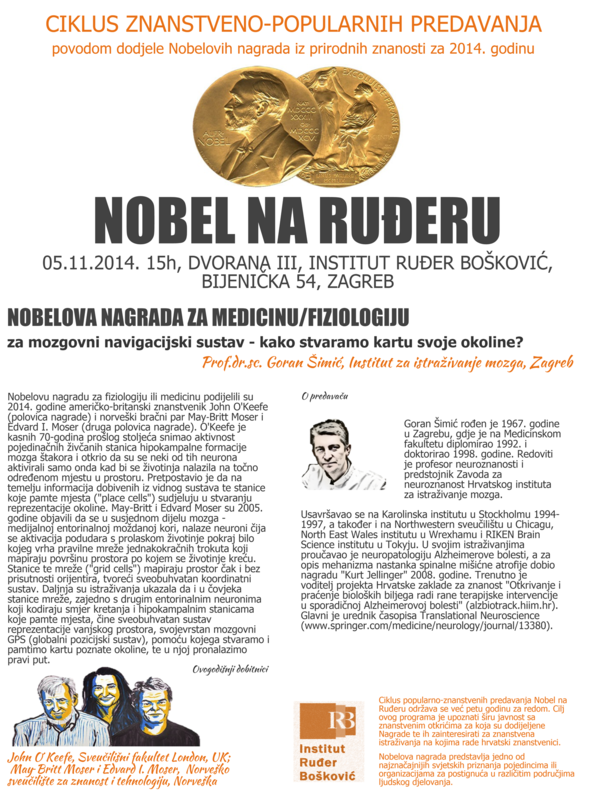 Tečaj stalnog medicinskog usavršavanja “Praktičan pristup bolesniku s demencijom” Zagreb, Hrvatska, 22. V. 2015. U: “Praktičan pristup bolesniku s demencijom” (ur. Klepac N., Borovečki F.), Medicinska naklada, Zagreb, 2015, pp. 1-6. Interplay between Aß, ceramides and hyperphosporylated tau in Alzheimer’s disease (2015) In: “Sphingomyelin and ceramides: occurrence, biosynthesis and role in disease” (Watkins, C., Ed. ), Nova Science Publishers, New York, 2015, pp. 53-84. Babić Leko M, Krbot Skorić M, Klepac N, Palac N, Langer L, Vogrinc Ž, Borovečki F, Hof PR, Šimić G. Improved early detection of Alzheimer’s disease by combination of event-related potentials and cerebrospinal fluid biomarkers, 5th Croatian Congress of Neuroscience, 17-19 September 2015, p. 70. Levels of cerebrospinal fluid macro and microelements in mild cognitive impairment patients with and without pathological levels of six Alzheimer’s disease protein biomarkers, 5th Croatian Congress of Neuroscience, 17-19 September 2015, p. 71-72. 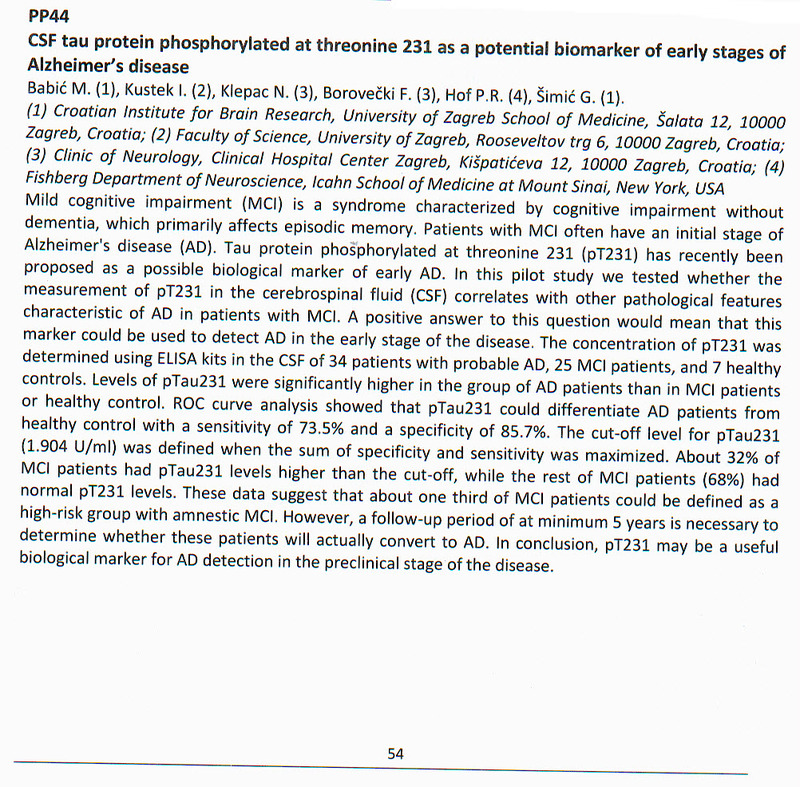 Correlation of macro and microelements and Alzheimer’s disease protein biomarkers measured in cerebrospinal fluid, 5th Croatian Congress of Neuroscience, 17-19 September 2015, p. 71. The project has officially ended on 31 Dec 2014 / Projekt je službeno završio 31. prosinca 2014. Hvala na posjeti - Thank you for coming!